Except as otherwise expressly agreed, Victoria Corp - Vietbird Travel and its clients agree that the terms and conditions for the services rendered by our company, whether on an individual or on a tour basis, shall be governed by the Terms and Conditions set out bellow and that the said Terms and Conditions shall form an entire part of the service contract, whether verbal or written, entered into between Victoria Corp - Vietbird Travel and its Clients. Reservations should be made via our online Request Form and sent it directly to Victoria Corp - Vietbird Travel's office in Hanoi. Upon confirmation of a reservation, a 30% (thirty percent) deposit is requested. The rest of the payment for the total tour or business service package should be paid to Victoria Corp - Vietbird Travel at least 14 days prior to clients’ arrival. Failure to comply may result in cancellation of the Client’s bookings without any refund of sums already paid to Victoria Corp - Vietbird Travel by the Client. Client may choose to pay the full price rather than a deposit, thereby avoiding a second transfer fee. From 21 working days prior to arrival date: 30% of total tour/service cost. From 9 working days prior to arrival date: 70% of total tour/service cost. There will be NO REFUNDS given for any unused or missed ground arrangements, sightseeing, meals or hotel accommodations. Payment can be made by cash, credit card or telegraphic transfer. Except for cash payment, a service charge may apply. Any bank charges levied by the sending bank relating to transfers to Victoria Corp - Vietbird Travel must be paid by the Client. A surcharge of 3% will be applied to payment by credit cards. Service vouchers will be issued one week before the departure date. We will make your booking and send you a confirmation within 3 working days once your payment has been processed. Clients are highly recommended to obtain personal travel insurance on their own since Victoria Corp - Vietbird Travel will not be liable for any accidents, illnesses, thefts or losses occurring during their holidays. See Liability clause for detailed information. Victoria Corp - Vietbird Travel is committed to provide the Services to the best of its capacity and upon the satisfaction of the Client. However, acting only as an intermediary between its clients and airlines, hotels, transport operators and other contractors, Victoria Corp - Vietbird Travel shall in no event be liable to its Client for any accidents, loss, injury, damage, death, delay as a result of any circumstances not attributable to the negligence of willful default of Vietbird Travel including any act or event beyond the control of Victoria Corp - Vietbird Travel and its contractors. Victoria Corp - Vietbird Travel shall not be responsible and/or liable for additional expenses and/or damages incurred due to any delay, accidents, natural disaster, political action, unrest, strikes, acts of war or other force majeure. 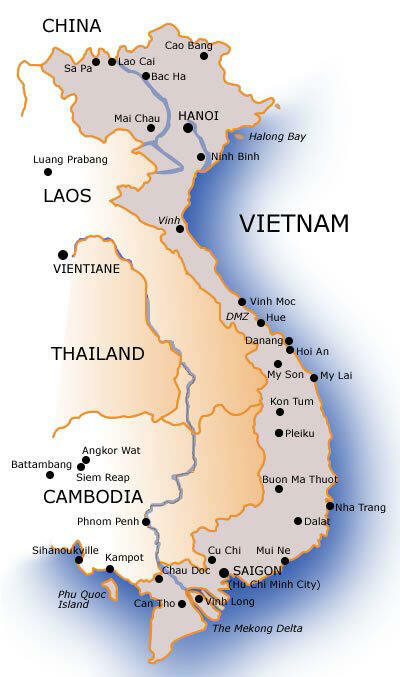 Victoria Corp - Vietbird Travel also reserves the right to to adjust the itinerary or to substitute hotels or to cancel a tour prior to departure in the best interest of its clients with or without prior notice. Victoria Corp - Vietbird Travel reserves the right to amend or alter any of the above terms and conditions from time to time. Suite 1812, VP5 Building, Nguyen Duy Trinh Str, Linh Dam Peninsula, Hoang Mai Dist, Hanoi, Vietnam.